It's only been three months since the last GSfP, but it's just about time for all the new sets for 2014 to hit the shelves. 70123 Lion Legend Beast. 120 pieces for $9.99. A lot of tan pieces plus new mini-ball joints. All that for $0.08 per piece? Nice. 70127 Wolf Legend Beast. 110 pieces for $9.99. And this one's $0.09 per piece. Lot's of white, plus light bley and silver. 31019 Forest Animals. 272 pieces for $19.99. Hinges, brackets, clip plates, bar plates, black brown bley, tan, and other colors all for $0.07 per piece. 31021 Furry Creatures. 285 pieces for $19.99. Similar to the set above, this one is more black and bley though. Still for $0.07 per piece. 31014 Power Digger. 64 pieces for $4.99. A decent amount of hinge type pieces, this set could work well as terrain at 7P scale, and it's $0.08 per piece. 60059 Logging Truck. 228 pieces for $19.99 A bunch of fun pieces, plus a new one, in predominantly green and brown. It's $0.09 per piece though. 76012 Batman: The Riddler Chase. 304 pieces for $29.99. $0.10 per piece for a wide range of brackets and slopes in black and bley. 70723 Thunder Raider. 334 pieces for$29.99. The only one of the current crop of Ninjago sets that is anywhere near affordable. It has plenty of clip plates and other interesting parts for $0.09 per piece. Here's a handful of non-human mechs for you to ponder. Planet Exploration Companion by SuperHardcoreDave. Absolutely fantastic. WIFFY Earthmoving by FLAVIO. Hockey Helmet Robot! SR Industries Racer by βroadside. I was originally going to post this, but then I did a little digging in his Flickr stream. SpaceQuadDroid12 by NateFalslev. This one's a render. New Soviet Republic - блоха by Happy Weasel. Okay, another person who's disabled downloads. Go look anyway. This time with more pictures! The killing field near stevenik's primary station. The battle for one of stevenik's secondary stations. The killing field later in the game. The station battle later in the game. The original battle report is here. This was originally going to be a "Terrain & Scenery" post. Then I realized I had chosen all my photos from Pierre Fiesche. Pierre has been around the Lego community for a while. He's done a lot of very interesting microscale work as well as some very fascinating spaceships. Tracer L.A.V. by Pierre E. Fiesche. You can see the Minifig Trophy used as a scale marker. Still, this looks as if it can be used at 7P scale. Spade F.C.V. by Pierre E. Fiesche. Similar design and size to the one above. "Ox" Light Module Transport by Pierre E. Fiesche. As you can see by the Tracer in the background, this is in the same scale as the other two vehicles. GRUNT Light Assault Vehicle by Pierre E. Fiesche. There's a lot of NPU in this picture. All of these designs would make great terrain or stations. You should check out the rest of his Flickr stream. There's some fantastic work there. I was planning on posting something different today. Aaaaaaand then I went and visited my local Lego store. When I wandered down to the back by the PaB wall I stumbled across one of these sitting on the back counter. Take a look at the piece under the tape. Yes, that's right, I have a whole box full of these. This is what's called a K2 box and it cost me $70.00 USD. I still haven't counted how many I purchased. However many, I think it's enough. Here's a better look at the label. 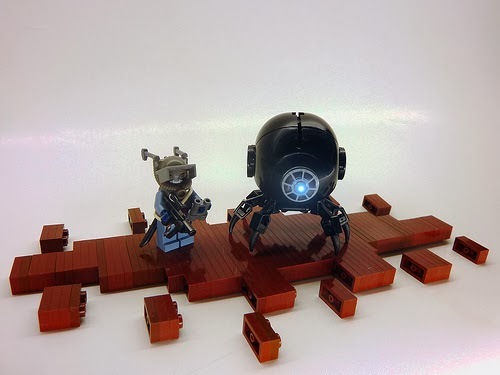 Back in September there was a serious buzz on the MFZ boards about these being available on the Pick-A-Brick wall. They finally made it to my area and I went big. They're out there people! Recently, as in this week, I put together a quick frame design. I had a stack of Lampholders in white so I decided to use them as the core of my build. This is what happened. 20 Lampholders and a smattering of other parts and we have a frame. The legs don't move. They do have the illusion of movement though which is really all that is necessary. But I wasn't happy with the arms. Flickr page. I swapped the arms out for something a little more flexible. I don't have all that many 1x4 Hinge Plates though, so I can't really mass-produce this design. That's what I really want because it's grown on me and I think it's fun. Flickr page. After some discussion on the Hangar and a great suggestion by MRaichelson, I arrived at this point. I now have three fully built and a few more under construction. Flickr page. The next step is to formulate attachments and create stations. When I have those finished I'll make another blog post. Did I mention they also qualify for MittenNinja's 3T Challenge? I occasionally wander over to MobileFrameZero.com/MFZ to take a look and see if any new and interesting messages have been posted. Today I found this blog post. I do not know the person that wrote this post but he talks about introducing his son and father-in-law to MFZ back around Christmas-time. They all seem to have had a great time and the post is so ebullient that I had to share it with all of you. It's really nice to see other people who are as head-over-heels about MFZ as the rest of us. I wasn't planning on doing a review this week but I stumbled on the Mega Bloks Sky Turret Defense set on clearance at K-Mart for $2.25 the other day. That comes out to $0.03 per piece so I bought it as I was interested in several parts. The minifig. The articulation on this is interesting as the feet are articulated along with the head, arms, and legs. The wrists rotate. The micro-Double Tip Spear in the left hand might make for an interesting SSR. Parts 1. You can see the base and cannon that form the centerpiece of the set. There's also a large coin that may have some applications. Parts 2. I like the textured hoses and the 2x2 roundels. Not sure what I'm going to do with that treasure chest. There are a bunch of sloped pieces with studs on the slope face. Also some 1x2 Cheese Slope-like pieces with a slightly different angle than Lego ones. Those 1x1 plates w/Bars and 1x1 Round Plates w/Bars plug into the textured hoses in the picture to the left. You can make somewhat of a frame from the pieces in this set. Score: -5 (B-). It's a fun set that has possibilities but get it on Clearance. I recently picked up a bunch of new parts while thrift shopping. I was happy with the purchase and a bunch of parts caught my eye as being viable for use with MFZ. One in particular stood out. Here's a new design, based around that Bionicle centerpiece. This one's the "Strider" variant, carrying Artillery attachments. The Thing. Another experiment with the same piece that formed the core of my Unicorn frame. I'm not sure if I'm going to leave this as a tablescrap or continue to work on it further. Snail. The sides and central main body piece of this build also came from the same thrift shop purchase. The Last Transit Gate is a blog written by Grass4hopper over on the Hangar. Looks like he's been at it since the day after Christmas. Welcome to the club! I picked this set up back before Christmas at my local Five Below. The Hasbro website has it for $7.99. I got it for $4.00. It has 75 pieces. I see 1x4 Hinge Plates, 1x2 Trans-Red Plates, 2x2 cheese slope and plate combos, a couple of 1x1 bricks that are only two plates tall, a bunch of 1x1 round tiles that have writing on them and are slightly larger than 1x1, and a couple of pieces that look like a 2x2-2x2 Bracket combined with a Hinge Plate. That's a real smorgasbord. In this picture we see the Kre-O ball joints. They're nice and sturdy but have this rubberized coating that makes them very stiff to move. Not a great trade-off. The head is interesting too, as it attaches to the 2x2 plate with the pole in the middle. Here's the first frame I built with this set. Pretty bulky, it could be statted up as 2Rh+d8/2B/2W. And the second. I know, not that great. Here's a station too. Once again, not that great but it's using pieces. I still have a handful of plates left over. Score: 5 (B+). If you can get it on sale like I did it jumps to a A+. 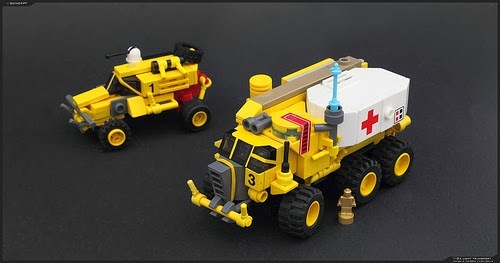 Now it occurs to me, that while I compared some of the parts from this set to Lego parts way back in the day, I never really did a proper review of this set. So let's give it a shot. The box. Nice and solid. This is currently running $6.98 at Toys'R'Us. It's listed at $7.99 on the Hasbro site. It has 66 pieces. Parts 1. One of those "gun muzzle" 1x1 Rounds, two of those multi-clip 1x2 bricks, two round end 1x1 rounds, three of the modified 1x1 Brick w/a 1x1 round sticking out of the side are what catch my eye right away. Oh, what about the 1x1 round with studs on both sides? Parts 2. I might as well just say that everything in this picture catches my eye. Except for maybe the 4x4 plate. Here's the Kreon. I really want to make use of that helmet/backpack piece. The speargun and flippers could come in handy too. 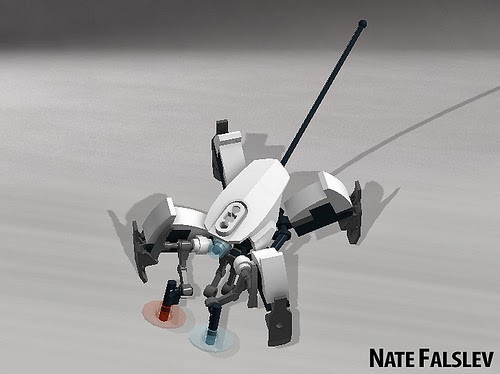 You could also use this as a mecha stand in at 4P scale. Is it below, at, or above the golden ratio? Above. (-10) @ $0.11 or $0.12 per Piece depending on source. Score: -5 (B-). You should be able to build a station or two right away with this set, or use it to enhance another set you have. For my first review of the new year, let's look at the Kre-O set "Air Assault". The package. This set retails for $4.99 at Toys'R'Us. The Hasbro website has it for $3.99, which is slightly better. The package is essentially a strip of folded cardboard with a ziplock bag glued inside. Which is good for storage of parts after you've opened it up. The instructions and a bonus microfig. The gun it's carrying has a bar stud on the side. The regular microfig that comes with the set. The piece on the left is supposed to be some sort of "glider" that moves via "sonic motion technology". Whatever that may be. The parts in the set. Two of those odd Stud w/Vertical Bar, Jumper plates, two 1x1 Plate w/Bar (closed ends), and the 2x2 Plate w/Dual Horizontal Clips are always useful. There are a couple of printed pieces which is nice. Then there's a 1x2 Modified Brick w/Bar Hole that's intriguing me. Is it below, at, or above the golden ratio? Above. (-10) @ $0.14 or $0.11 per Piece depending on source. Once again Brickset has posted a list of the new polybags for the coming year. Unfortunately there doesn't seem to be much information to go on besides the picture of the sets themselves and some potentially incomplete parts lists. So this year I won't post links to all of them, just the ones I find the most interesting. 30188 Cute Kitty. Don't laugh. I see 1x1 Technic Bricks, Clip Plates, Bar Plates, Lever & Bases, cheese slopes, and some other things that microscale mecha builders like. 30226 Police Helicopter. There's been a Police Helicopter polybag before. I have one in my review pile right now. This one looks better, it even has more parts. 30244 Anakin's Jedi Interceptor. Star Wars polys can be tricky. They can be limited releases like the Umbaran MHC from last year, or suffer under the heavy "Star Wars Tax". I like the colors and parts on this one though. 30263 Spider Crawler. The Legends of Chima polybags can be overpriced. This one looks to have some interesting parts at a decent quantity. 30302 Spider-Man. Good parts, good colors, good quantity. 30300 The Batman Tumbler. 57 pieces and it builds a microscale Tumbler. Awesome. 30189 Transport Plane, 30246 Imperial Shuttle, and 30247 ARC-170 Starfighter also have good parts and good piece counts. As always, YMMV. Hopefully we get solidified information soon that will allow better decision making. In a change of pace for the new year, let's look at videos that show us how to build microscale mecha. 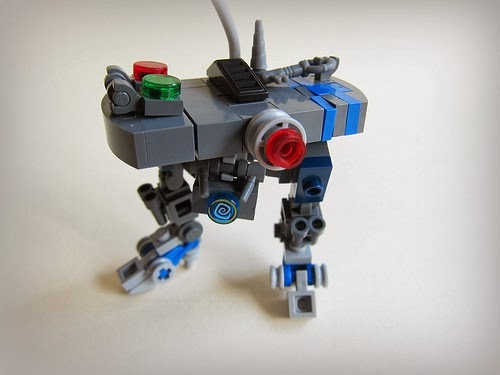 Lego Mech + Instructions. 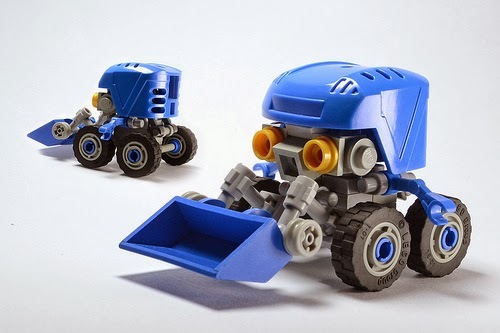 It's a fairly interesting build, the creator says he doesn't play MFZ but does build a lot in our scale range. Which just confuses me. I have featured his videos before on my links page. 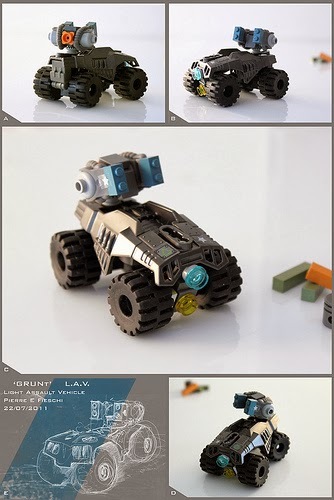 Mini Lego Robot Instructions. This video shows the construction of five mechs. They're small and kind of simple. How to Create Awesome Lego Weapons. A video featuring the construction of some weapons. A lot of the pictures are blurry. Both this and the previous video feature music rather than a voice over like the first. Lego How-to 2: Heavy Power Armor. This video is for "heavy power armor" but should be easily adaptable to MFZ. Nice animation. Another video with music rather than voice-over. These next three don't feature instructions. 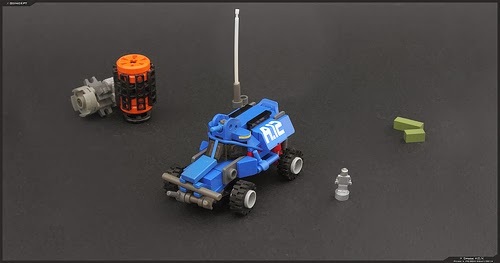 Micro Mech 01. This video just shows off the mech, but it is available on e-Bay. LEGO Pacific Rim - Jaeger Gipsy Danger. 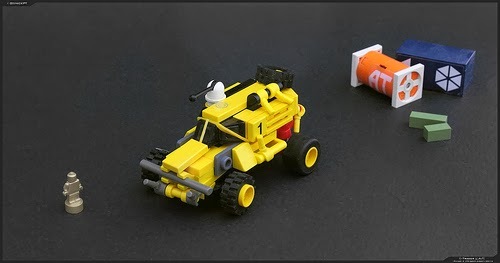 It's way too large for MFZ but you may be able to modify it a bit and get it back into scale. Lego Mecha (Moc) #1 - Tiger. It has an interesting opening torso.